Whitfield is a town in Florida with a population of 3,215. Whitfield is in Manatee County. Living in Whitfield offers residents a suburban feel and most residents own their homes. Many retirees live in Whitfield and residents tend to lean conservative. 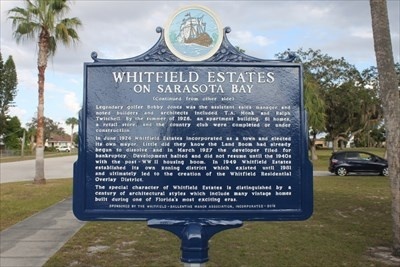 Located on both sides of Tamiami Trail, near the Sarasota-Bradenton International Airport and about a mile north of the John and Mable Ringling Museum, New College of Florida and the University of South Florida Sarasota-Manatee, the 3,000 residents of Whitfield Estates enjoy the distinction of living in the oldest planned community in Manatee and Sarasota counties. We have sold quite a few homes in the neighborhood and everyone tells us how much they love living here.